What Is A Cohabitation Agreement (And When Do You Need One)? Have you recently moved in with your significant other or are you planning to do so? If so, you’re entering a high-stakes game. Like in most high-stakes games, things could go your way. If that happens, the payoff could be huge. You could, as they say, live happily ever after. But if things don’t go well, that’s when things could start to get messy. I asked my colleague and family lawyer: Laurence Klass from Watson Goepel to shed help shed some light on Cohabitation Agreements. The rest of this article is what he had to say. Breakups are never pleasant, and unfortunately, that’s when disputes can get nasty. Most people don’t think that it will ever get to that point with someone they love, but sadly, breakups are when they see an entirely new side to the person. I’ve seen this happen plenty of time. Two people, let’s say both of them divorced and with kids, fall in love and move in together. After while the relationship starts to fall apart. What are our kids entitled to? What do we do with the property we bought during the time we were together? Typically, answering these questions is tough, and become the centre of a legal dispute. Other times, when people have the foresight (and good advice from a lawyer), they get a cohabitation agreement, making separations much easier. 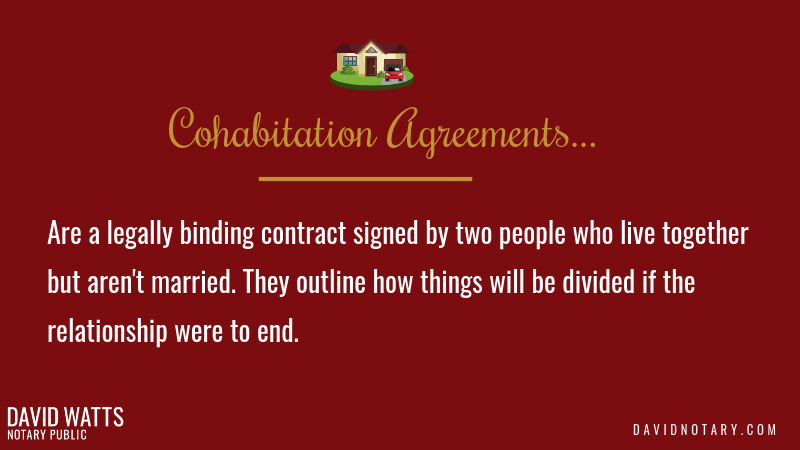 Much like a marriage agreement or a prenup, a cohabitation agreement is a legally binding contract signed by two people who live together or are planning to move into the same home. Cohabs, as these agreement are sometimes called, outline how things will be divided if the relationship were to end. In British Columbia, as long as the terms are deemed fair and don’t infringe on anyone’s individual freedoms (like, for example, specifies who a person can or can’t talk to), these cohabitation agreements can be pretty wide-ranging. Yes having one makes sense. If you are getting married or plan to, your cohab agreement can be worded in a way to ensure that it will still remain in force once you are married. It also gives you a chance to come to an agreement of how things will get divided while you are still in the relationship (and in good terms with your partner). Cohabs reduce some of the stress during breakups and helps avoid the costs involved with disputes. They also help make sure that both parties take care of their families, and protect the inheritance that they give or receive to their own family members. By having a cohab, you are resolving in advance what’s going to happen to the property if the relationship breaks down. Everything is much quicker, cost effective, and less stress. In short, you can move on quicker with your life. In BC, if a couple doesn’t have a cohabitation agreement and a dispute ensues after their relationship breaks down, the decision as to who gets what will be governed by the Family Law Act. According to this act, property and debt is divided equally among both parties. It becomes the responsibility of each person to provide evidence proving who brought what into the relationship, which is sometimes difficult to do. The time to have these agreements made is when people are on good terms. If you wait and the couple isn’t on good terms, lawyers get involved, and that can get pricey and could take years. Do You Need One If You Are Married? Under British Columbian law, cohabitation agreements hold the same power as marriage agreements (in fact, they are the exact same thing, except named differently). These agreements apply to anyone in a married couple, a common law relationship, or who are living together. They can even include clauses that say that they remain valid if the status of the relationships transition from cohabitation to common law to marriage. 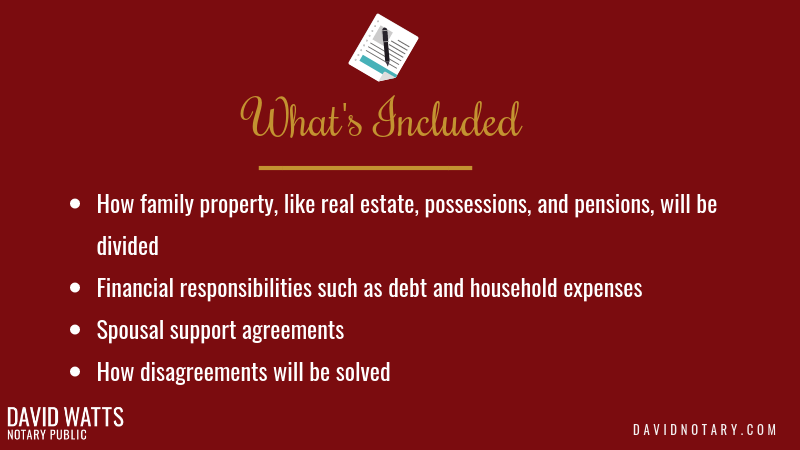 What Do You Need to Include in a Cohabitation Agreement? In BC, certain things cannot be included in a cohabitation agreement. Stating parenting responsibilities for children who have not been born. Laying out future child support for any unborn children. Do You Need to Update Cohabitation Agreements? Cohabitation agreements should be seen as a living document. They need to be reviewed at regular intervals to keep them current and make sure they still do what they are meant to. We recommend that people update their cohabitation agreement every five years, or whenever a significant event, such as a marriage or the birth of a child, occurs. Additionally, if one of the members of the agreement were to suddenly receive a large sum of money or a property in an inheritance, for instance, the agreement should also be reviewed. If you would like to make sure that this update occurs at a regular interval, you can include a review clause in the document itself. This clause would be triggered after an event (such as the ones mentioned above) or could state that the agreement needs to be reviewed every couple of years to remain valid. Whatever you choose to do, the main point is that it’s important to look at the agreement regularly to make sure it continues to work for both parties and to make sure that it hasn’t become significantly unfair. 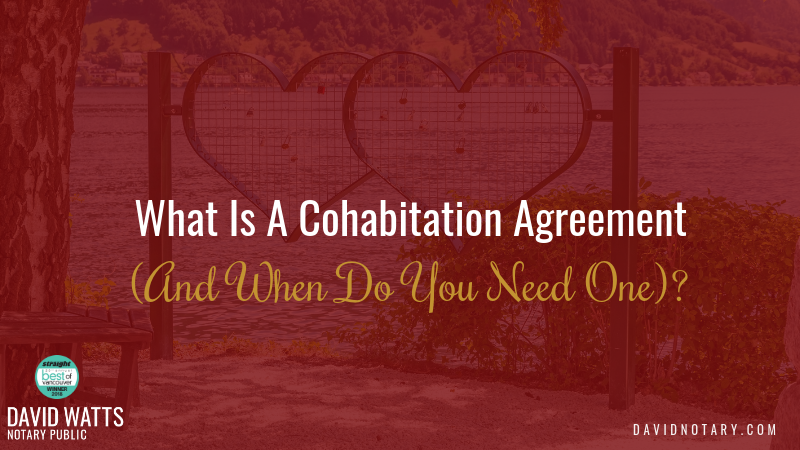 How Do You Get a Cohabitation Agreement? There is a growing trend of people who choose to try to save money by using resources online to create their own cohabitation agreements. While an online template gives the appearance of saving time and money, this is just not true. There are plenty of precedents of people who have entrusted their property and debt to these online templates, only to find out that they hold no legal value, causing their assets to be divided according to the Family Law Act. If you want your cohabitation agreement to stand up in court, you need a family lawyer who can tailor it to fit your specific needs. Both parties should also consult independent legal counsel to make sure the agreement is fair and gives adequate coverage to their own interests. If you have any more questions about Cohabitation or Marriage Agreements, let me know and I’ll put you in touch with a family law lawyer who can assist. A big thanks to Lawrence Klass for this great information!